Instead, below I’m going to look at some developments from our draft order — what changed during the preseason that heavily influenced our final draft positions. This is a data set of 1, so it might not be the be-all, end-all, but it does provide a glimpse into how an analysts’ draft thinks some things should fall. Obviously, with only one draft to consider here, a player falling down the draft board is more telling than one rising up — a riser only needs one drafter to buy in, but a faller needs the entire league to bail. So what follows will mostly be about falling draft stock, but there will be some nods to risers as well. Peterson went 119th overall in the draft, the 45th running back off the board. That’s a bit ahead of his current spot in our staff rankings (he’s ranked 145th, RB47), but as I was the person to draft him, I am uniquely qualified to speak to the drafter’s motivation. Peterson is the type of player who will fit on some rosters and not on others. For a team that has a need at the position, he’s a dodgy play — he might be done, like Arian Foster in Miami, or even Peterson himself in New Orleans a year ago, and Rob Kelley or Samaje Perine might take over. But if Peterson can be anything resembling vintage Peterson, if he can even just be decent enough to keep a two-down job, he has upside. And because of that, he makes sense on a team that doesn’t need him but can afford to take the risk. And with Todd Gurley, Jordan Howard, and Peterson’s teammate Chris Thompson on my roster, I could afford the flyer, even a bit earlier than he perhaps should have gone. This one is pretty simple — it gradually became clear that Foreman would not be ready for the regular season (he’s on PUP now), and so Miller, unexciting though he may be, has no choice but to be the lead dog in Houston. That led to him being drafted at his highest point all offseason (40th), while Foreman fell to 130th and that would probably be lower if our drafters knew proof-positive he’d be on PUP at the time of the pick. 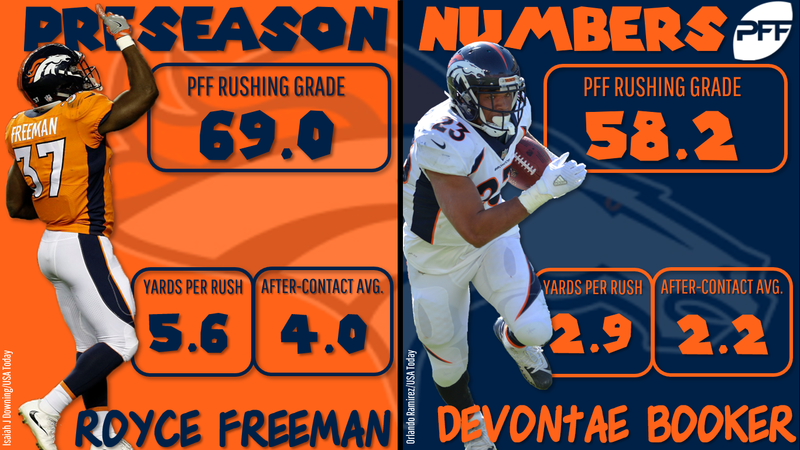 While it took until Monday for the Broncos to really confirm Freeman would be the team’s No. 1 when the season kicks off, the writing was largely on the wall all preseason, with Freeman outperforming Booker by just about every rushing measure. Booker could have receiving upside, but Freeman will be the primary ball-carrier. The rookie’s draft stock held steady (he went between 51st and 57th in every mock we held since the draft), but Booker’s finally fell significantly, from the early 100s to 149th. The ambiguity of the Colts’ backfield hurt each individual player — Mack and Hines went at their lowest draft position of any staff mock we’ve held (since the draft, for Hines), while Wilkins has risen a bit. Mack was a sixth-rounder for much of our draft season but fell to the eighth here, while Hines went undrafted for the first time since landing in Indianapolis. Ultimately, this looks like a stayaway altogether until someone shows he can hold the job. It took a long time, but we finally saw a sea change in the opinions on the Tampa Bay running backs. Jones had hovered around the 50s in drafts all offseason, but as we got into the preseason and he continued to lag behind Barber and look bad, this draft saw him fall to 82nd. Barber, meanwhile, had gone undrafted in three of the last four staff mocks, but rose to 109th here. It’s interesting that Jones still went two-plus rounds higher, but it does show a change in opinion. The offseason talk surrounding Christian McCaffrey was one thing. They said he was going to get massive work, but even with that our drafters tended to take Anderson in the 70s-90s in drafts, as a de facto Jonathan Stewart. But once the preseason got going and we saw that McCaffrey (a) looked good, and (b) might actually be getting the workload they talked about, our drafters let Anderson plummet. His lowest draft slow in an individual draft all offseason had been 112th; he went 161st in this draft. Believe it or not, this was the first draft all offseason long in which Bryant went undrafted. At least one person on our staff held out hope all offseason that he’d land somewhere and offer upside, but as we got into training camp and then the preseason and all we got from Bryant were rumors and no signings, we all finally cut bait.